Get the real job done, anywhere, anytime, on any device. Kumita by Hoppler offers end-to-end solutions to ensure success in every deal. From marketing your listings to contract signing, Kumita equips you with everything you need. Productivity is guaranteed even when you are on the go. Kumita by Hoppler has a simple and all-in-one dashboard where listings and clients can be managed efficiently. Stay on top of your team's sales progress and get a real-time report of your business. 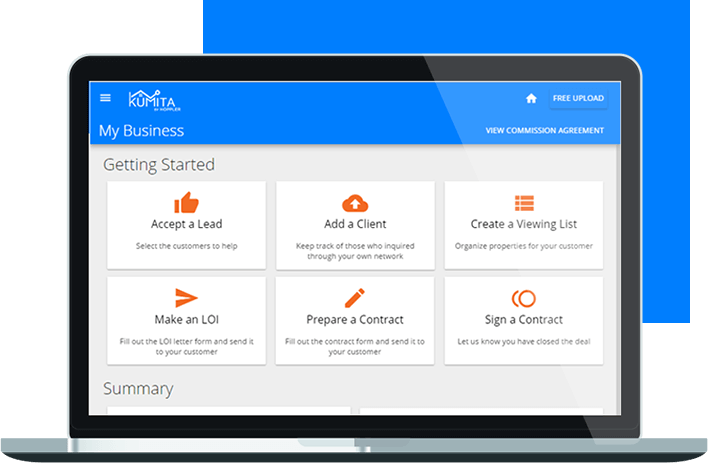 Software Features Kumita by Hoppler is a comprehensive real estate CRM Software that connects buyers and sellers from every stage of the sales process — marketing, selling, offering to closing. Manage your inventory conveniently in one database and stay on top of every transaction. Get notifications whenever you get leads. Effectively manage clients and leads to guarantee that every customer is handled properly. Keep track of your schedules without trouble by creating viewing lists that you can also send to your clients. Save your files in your own online storage. You no longer have to carry papers during client meetings. Generate automated contracts you can send to your customers. Save time and easily accomplish contracts even when you are on the road. Get a real-time overview of your business. See your progress and check what is working and what needs to be improved. Learn how Kumita users get 30% more qualified leads. 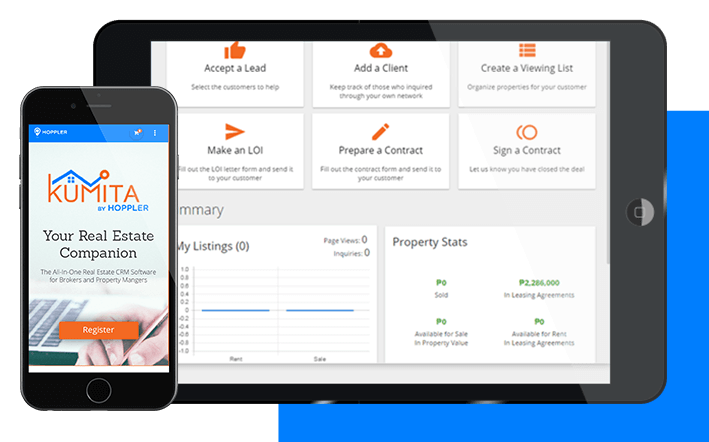 Manage your real estate business with ease. Kumita is the Philippines' first end-to-end free real estate CRM software exclusive to Hoppler Partner Brokers and Property Managers. Get started today by signing up and listing your properties.